Spotlight in OS X Mountain Lion is both a technology and a feature. 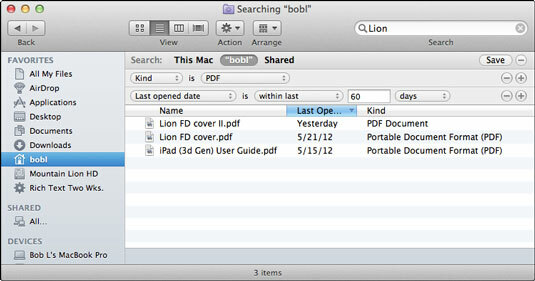 The technology is pervasive throughout Mountain Lion — and is the underlying power behind the search boxes in many Apple applications and utilities such as Mail, Contacts, System Preferences, and Finder. With its power provided by Spotlight, this definitely isn’t your father’s Search box. Press Command+Option+F to move the cursor to the search box of the active window. Type a single character in the Search box. The window starts displaying the results. Not only does the window become populated with files that match the letter(s) you typed, at the same time, a menu drops down below your cursor to offer search suggestions, such as Filename, Kinds, and Downloaded From, as well as others such as Dates and Sent By. Typing additional characters narrows the scope, so the more you type, the fewer matches and suggestions you’ll see. If you want to change the criteria for one or more of these items, it’s the same as changing criteria for a Smart Folder: Click the item in the Sidebar, and then click the Action-menu button and choose Show Search Criteria. When you’re done changing the search criteria, click the Save button to resave your folder. If the folder or volume you want to search isn’t This Mac or your Home folder, open the folder you want to search, and type your query in the Search box in that folder’s window. The default is to search files’ contents if it can. 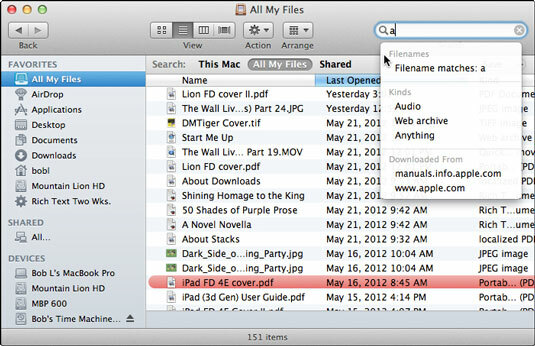 Mountain Lion’s Spotlight can search the contents of files created by most popular applications. To search for a file by its file name, choose Filename Contains from the drop-down menu. When you find the file or folder, you can open any item in the window by double-clicking it. You can also start a search by choosing File→Find (shortcut: Command+F). You have a choice of where to search. You can choose additional search criteria — such as the kind of file and the last date the file was opened (Within Last 60 Days) — as well as other attributes, including Modification Date, Creation Date, Keywords, Label, File Contents, and File Size. To add another criterion, simply click the + button on the right side of the window. To save a search for reuse in the future, click the Save button on the right side of the window. Try choosing different options from the window’s Arrange menu — Application, Date Last Opened, and so on — to see the search results presented in different ways. So there you have it — fast searches made easy in the Finder. But there are many ways to access the power of Spotlight, and the Search box in the toolbar of Finder windows is merely one of them.